The former Ireland striker left his role with Sky Sports last summer. Quinn with Graeme Souness and Kevin Kilbane this morning. 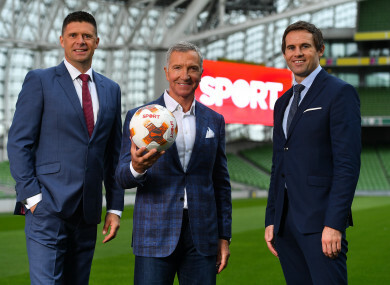 NIALL QUINN IS back in football punditry just 12 months after leaving Sky Sports to pursue a new business opportunity, with the former Ireland striker part of Virgin Media Sport’s line-up. As part of TV3′s major rebranding, the Ballymount broadcaster has launched a new dedicated sports channel, Virgin Media Sport, which will be the home of its Champions League and Europa League coverage. The channel will be available at no additional cost to Virgin Media TV customers and will carry more than 400 live games this season, including Tuesday and Wednesday evening Champions League fixtures. Sports fans who are not currently Virgin Media customers can purchase a monthly subscription for the Virgin Media TV app, which will cost €20 on a 30-day contract and give them access to the station’s expanded coverage. Virgin Media One — formerly TV3 — will offer Tuesday evening games to Irish viewers on a free-to-air basis, as well as the Champions League and Europa League finals. Tommy Martin will front Virgin Media Sport’s European football coverage, with Quinn joining pundits Graeme Souness and Kevin Kilbane in the studio. Also announced today, the broader Virgin Media Sport team will include Brian Kerr, former Ireland midfielder Keith Andrews and presenter Niamh Kinsella. “Virgin Media Sport is the new home of European Football in Ireland,” Paul Farrell of Virgin Media said. In addition to live European football, Virgin Media One will have live Champions Cup coverage with Joe Molloy, Shane Horgan and Ronan O’Gara ahead of the return of the Six Nations in February. Email “Niall Quinn returns to punditry as part of Virgin Media Sport's line-up”. Feedback on “Niall Quinn returns to punditry as part of Virgin Media Sport's line-up”.